Sergio Garcia's title defence effectively came to an embarrassing end as he took an amazing 13 shots to play the 15th hole in the opening round of the Masters. Garcia carded a 13 at the par 5 after landing five shots in the water. The eight-over-par effort ties the record for the highest score recorded on a hole at Augusta, with Tom Weiskopf doing it at the 12th in 1980 and Tsuneyuki Nakajima at the 13th in 1978. 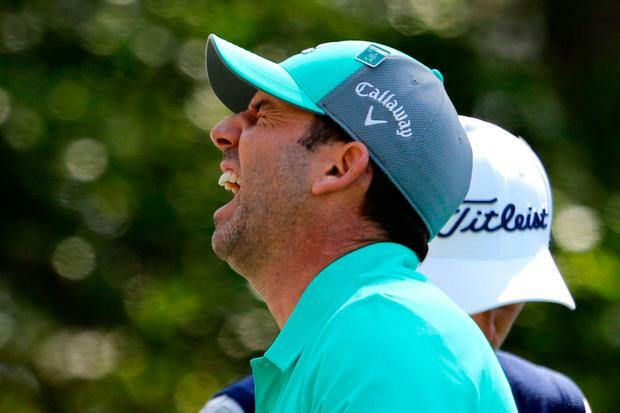 After his second shot - with a six iron from 206 yards - found the water in front of the green, Garcia took a penalty drop and left himself around 90 yards to the green, but repeatedly hit wedge shots onto the putting surface and watched them spin back into the hazard. "I don't know what to tell you," Garcia said. "It's one of those things. I feel like it's the first time in my career where I make a 13 without missing a shot. Simple as that. "I felt like I hit a lot of good shots and unfortunately the ball just didn't want to stop. So it's just unfortunate, but that's what it is. "It's not the first time the pin's been there, but with the firmness of the greens and everything I felt like the ball was going to stop and unfortunately for whatever reason it didn't want to." Garcia named his first child Azalea after the 13th hole at Augusta where he made a crucial par in the final round last year. A repeat of that was already unlikely as the 15th hole is called Firethorn, but Thursday's events made absolutely certain.